Home ⁄ Frequently Asked Questions ⁄ What Chemistry makes Clearfil SE Protect Different from its Competitors? CLEARFIL SE Protect contains a new functional monomer MDPB, which exhibits an “Antibacterial Cavity Cleansing Effect”. 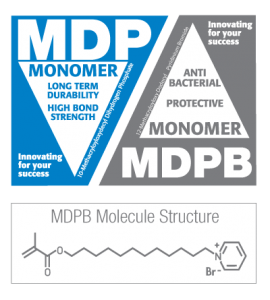 The antimicrobial effect (MDPB) is greater than with current cavity cleansers on the market. contains the first antibacterial monomer (MDPB) which cures and deactivates the enzymes which cause dentin bonding degradation (according to external independent research), as well as eliminates the need for separate application of CHX (chlorhexidine) or Benzalkonium Chloride treatment. In addition, CLEARFIL SE Protect is a cost and time saver by eliminating extra steps. Fluoride-releasing and cavity cleansing features put CLEARFIL SE Protect in a category all its own.